In celebration of Mardi Gras this week, Nocatee is hosting its very own Mardi Gras Party! 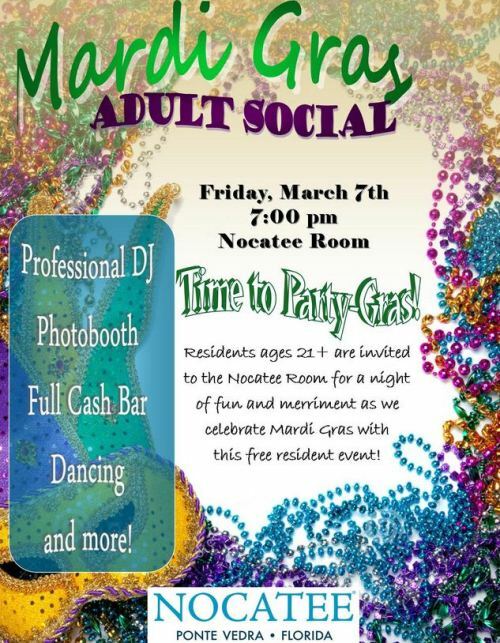 Residents are excited to gather in Crosswater Hall's beautiful Nocatee Room to enjoy the yearly Mardi Gras Nocatee Adult Social on Friday, March 7th. DJ Jonathan will get everyone up on their feet and out on the dance floor during this fun, FREE event for all adult residents and their friends. Residents are encouraged to bring their best Mardi Gras masks and beads with them as an on-site photo booth will be there to capture festive photos. A full cash bar will be available as well. Nocatee residents are excited to be able to celebrate this once-a-year event so close to home with fellow community members.